Interviewee: Iduvina Hernández, Director of the Association for the Study and Promotion of Security in Democracy. Alice Klein (AK): Why are there so many human rights violations in Guatemala and why do they go unpunished? Iduvina Hernandez (IH): This question has two types of answers. These things are happening right up to this day, 12 years after having signed the Peace Accords, through impunity, which is of a structural nature in Guatemala. There was the signing of the Peace Accords: for example, in the accord on Strengthening of Civil Power, a series of changes in the security system that particularly indicated the army as the main agent in the committing of human rights violations during the armed conflict. The creation of the Historical Clarification Commission was also agreed, a commission which had some limitations, because it was unable to identify by name the people responsible – the way it was phrased is that they were unable to individualise responsibility. You could say that the state committed human rights violations or that the army was responsible for something, but you couldn’t say such-and-such general ordered such-and-such plan, ordered such-and-such thing, was executed by this Colonel, with this captain, with these soldiers, at this place, on which day. The commissioners were very intelligent in how they used their mandate; what they did was carry out, to the finest detail, the place in which the violation was carried out, the unit responsible for carrying out the action, and the victims. This report had very positive support, it was drawn up by the Office of Human Rights of the Archbishopric, with Monsignor Juan Gerardi at the head, who identified by name many of those responsible. Another important help was the release of documents by the National Security Archive, a U.S. NGO [she says NGO, but I don’t think it is.] that revealed information about the Guatemalan army from secret U.S. files, including names of officials and units with the years in which they were in specific locations. It’s not entirely complete, because as the enquiry has deepened, it has become clear that there are some things missing, that there are some officials who seem to have their biography protected by the U.S., as the details of their missions in Guatemala don’t appear. Therefore it is difficult to fit one thing to another … but it has been a big help. All of this is external help, because there wasn’t any conviction to pursue the violators of human rights during the armed conflict, from which to start a judicial process, from which to send a lesson to the future that these violations were not going to be tolerated. From the moment in which the dust settled on the Peace Accords – and what I’m going to say I have said in other places, I don’t have any problem in saying again – there was a certain level of complicity from the UN’s own office, which had to have verified, acceptance of conduct which did not match up with the disposition to overcome human rights violations. And it turns out that the person assigned as verifier for compliance of the Accords [director of United Nations Verification Mission] is Jean Arnault, who was also the UN moderator during the negotiations for the Accords. In the end he was a kind of judge, and because he was responsible for verifying the Accords which he had helped create through the process of mediation, he was quite lenient towards failures on the state apparatus’ part, especially the army. The Guatemalan army finally found mechanisms for evading full compliance with the Peace Accords, with regards to correcting conduct which allowed it to become the most criminal institution that could exist in Guatemala, and for the most part in the whole of the Latin American continent. This carries on up to this day. With the exception of Lima – father and son, who are in prison for the murder of Bishop Juan Gerardi – there is not a single high ranking military figure in prison with a clear sentence for having committed an act of human rights violations against the population, nor a General, nor a Colonel, not one person accused of genocide or forced disappearances. All these policies have created a system of terror and barbarity in our land. By these means the army considers itself victorious, and if it considers itself victorious and society accepts that what it did was OK, that conduct, maintained through a tolerance of impunity, prevents the Guatemalans from getting angry at human rights violations, at the many human lives that are lost day by day. They don’t get angry that a women is mistreated, that a group of judges decide to alter documents to pass the illegal adoption of three children, that one has to go on hunger strike to incite the slightest bit of feeling. But they kill bus drivers, they kill children, they kill young people, people are lacking basic resources and society doesn’t get angry. We have lost the ability to get angry because we have developed a high level of structural tolerance, because it works this way in the Justice system with judges, in the Public Ministry with the public prosecutors, lawyers, specialised in developing mechanisms of impunity for crimes against the Guatemalan population. These structures that functioned during the armed conflict were allegedly for pursuing the rebels, but they went much further than that, because the same rebels were pursued violently, annulling the country’s own laws, they weren’t dismantled, the crimes that people committed during this time weren’t processed … they continue to this day being powerful structures. In this sense a schema of human rights violations exists and survives in Guatemala, because there is a system of structural impunity that maintains itself in the non-compliance with the essence of the Peace Accords signed in 1996. AK: In your opinion what are the causes of femicide? IH: There are two terms: femicidio and feminicidio. I’m not a technical expert in the matter because I’m not an activist in the feminist movement, where there is the debate about whether it is femicidio or feminicidio. But I can talk about the murders of women, which are becoming more and more violent each time they occur. I want to say that this rests much on what was raised in the previous question, but that it also feeds off the cultural sphere in which we find the roots of personal character beyond the Guatemalan State. This is a mutually exclusive and expulsive State, economically and socially – those that have less are those that are mistreated. With regards to gender, women – in the field of State conduct and of society – are the people that are least protected legally in all spheres, and most unprotected with regards to using and claiming their rights in society. The woman is seen as a machine for having children or as an object of desire or in certain social strata if it is a woman who furthermore – and here comes another factor for exclusion – is of ethnic origin. The indigenous people make up the greatest part of the population in Guatemala, but at the same time they are the most excluded. So, if the reason duplicates itself in the sense that in addition to being a woman, she is indigenous too, there is a double reason for discrimination, which indentifies them as people suitable for servitude, as domestic staff in the houses of wealthy people, practically a system of slavery. In Guatemala a good number of families have the means to pay a woman, generally indigenous, and often very young, a minor, for permanent domestic help, from 6 in the morning to 10 at night, without rest, responsible for everything, for sweeping, mopping, washing the clothes, cooking, going to the market, doing a thousand things, a system of slavery, which is culturally reproduced and inherited through families. This way of seeing the woman as an object of reproduction, as an object of desire, and as an object of servitude, builds the elements that are also reproduced in the media. And the result is that, if the woman in a poor district of Guatemala is young, the single fact of her having a tattoo means she is identified as a member of a gang. And since she is a gang member, the media practically say that she deserves it. I’m not expecting the media to make political propaganda, or publicise in favour of human rights, but neither do they have to publicise in favour of what is happening. In continuing to feed these prejudices, the media should stress, at the same level and in the same space, actions such as the murder of the lawyer Rodrigo Rosemberg, the murder of any woman, of any person, but especially of any woman. In Guatemala we have a print media, in an illiterate country, which is a ‘boom’ business in Latin America. There’s a tabloid with the highest circulation in Latin America per capita; it’s called Nuestro Diario and it’s dedicated to sensationalist crimes full of images, because photography stands out. So if the title is “they find her chopped to pieces”, it’s feeding the morbidity and it’s earning money and profiting from the death of people, in this case from the death of women, of which there are plenty. The discussion in the sexist opinion that prevails in the spheres of the security authorities and justice and in other spheres, like with some conservative columnists is – on the deaths of women, if the proportion of deaths of men is always much greater than women … they complain if there are less women that die in comparison to men … so the men should claim that there are hombricidios because the women claim that there is femicide; the womens’ fight to put violent murders on the agenda is questioned and condemned by the male voices in the media, and by the authorities. But there are various factors that set out the construction of these terms: one relates to the brutality of the murders – generally men are shot, whereas with women, in 90% of the cases the attack is sexually violent, there is mutilation, often to the breasts and the extremities, apart from other types of evidence of mistreatment prior to the murder, so there is a cruelty and rage against the person’s feminine expression; and furthermore, in a good number of cases, there are connections with the partner living with the woman, which implicates the existence of an extreme expression of domestic violence. These are the factors, not the number of women as such, because there may be more than men and because numerically, from the point of view of how many cases are reported, there has been a substantial increase of more than 500%, or be it, from 100, 200, to 500, 700 or more in only one year. Therefore it is a number which really alerts us in an impressive way about the need for this to be documented. If we had to compare this with the case worldwide that raised the alarm about this situation against women, the case of the women killed in Ciudad Juárez [North Mexico], in Guatemala the number is higher, in the same period, despite Guatemala having a smaller population than Mexico, or from the point of view of Guatemala City in comparison with Ciudad Juárez. Therefore, in the context of this foundation of tolerance, of impunity, threshold of tolerance, culture of acceptance of all violent acts and social exclusion, and of the description “she deserved it because she was part of a gang”, or in the past, they said that she was with the guerrillas – and that’s why they were killed. We haven’t overcome this attitude as a society and in the case of the media, we haven’t even been capable of questioning it, nor capable of questioning it in the educational field, all of which feeds these types of situation. IH: Amongst other things for reasons that I have already raised. We would see, and that is also what feeds the maintenance of these cases. If the woman is a person who has a tattoo, that stigmatizes her as a member of one of the gangs or as a person linked to a gang, even if she only got a tattoo because she liked it or wanted one. With this argument, the police say “she’s a marera”, and then it’s a case of not having to bother to investigate [the death]. They inform the Public Ministry and the Public Ministry validates the police decision because neither of them want to demand an investigation. It stops being a priority case for investigation. The judges also go along with this and the media explain that a body has appeared, etc, and that it has a tattoo, and that a tattoo is a social code which signifies that this person is disposable. We have built up a social perception that there are disposable people in our society, in terms of gender, relations, characteristics, age, youth. Martin Mowforth (MM): Are there no daily papers which press on these issues? For example, I have read a daily paper, the first three pages of which were about CICIG. I know that the message of the report was from the right, but at least it gave coverage of the problem. But are there any other daily papers which are a little more questioning or investigative? IH: No, here in Guatemala when we talk about investigative journalism it’s El Periódico. So it is called, but in reality it uses a team to get evidence, at times facilitated by a source who has their interest against a given functionary. That is to say that they use the concept of investigative reporting to carry out campaigns against a given actor/person in the State when it suits them to affect/get at someone. I’m a journalist by profession. I said that I was going to take a year’s sabbatical and I’ve had 12 years of sabbaticals. I’ll probably never return to journalism. In the period in which I worked, there was a weekly paper, the Crónica, which probably wasn’t the best that Guatemala had or the best example of journalism, but in its time it did have a different attitude. It was mid-conservative and its owner was conservative, but the journalists who were working there had some power, and we even managed on occasions to prevent the publication of certain stories or certain slants of given stories with the arguments of professionalism. So being that the owner was a conservative man as well as the President, it became clear that the Crónica was a media a bit too questioning and so it was disappeared by the government of Álvaro Arzú. After the Crónica was stopped there was no written media in Guatemala which took a questioning stance. Of the traditional media, that is Prensa Libre, El Periódico, Siglo XXI, La Hora, which have national circulations, I would say that La Hora is a little more questioning, but with many weaknesses from a professional point of view. Beyond that we are talking of a kind of reporting which in reality takes advantage of the moment when it can exploit someone. Technically we can question this kind of reporting. I was a Professor of Journalism and I read the media critically – I held my head in my hands every time I saw these barbarities, almost every day. Beyond that, independent media don’t exist with the exception of a critical journal called La Cuerda, which is feminist. It’s produced by a collective of feminist women, it’s more open, more democratic, and obviously its focuses are from a more feminist perspective, which in my opinion has some limitations. It’s for an elite – the informed elite of the feminist sector of the capital city of Guatemala who receive it by subscription. The women of La Cuerda are great activists and very strong women in Guatemala’s feminism, but their communication media is very limiting. Also there’s an opinion journal called La Coyuntura which is circulated every 15 days by internet which also means that whoever receives it has to have access to the internet, which is not great. As regards the radio, which is the most extensive media, ownership of commercial radio is concentrated in four family groups. Open television is concentrated in the hands of just one person and cable television is controlled by three companies which are also associated with the radio and written press because there is a characteristic of the written press. Prensa Libre started as the property of five families, each have 20 % of the shares. So there was no overall majority stakeholder. As the first owners died off, the children developed another vision for the running of the business and began to sell off some shares. Some of the associates began to accrue more shares than others until today when there are just two families who own 80 % of the shares of all the holdings of those companies which make up Prensa Libre, which is not just the daily paper but includes much more such as a cable television channel. And very probably, one of the owners of the daily La Hora is the person who is jumping to the defence of the new owner of Siglo XXI, which was bought a month ago when ownership changed hands. What this means is that the press, radio and television are concentrated in very few hands and independent media don’t exist. That’s what facilitates the reproduction of an image of social conservativism in Guatemala. It’s very similar in Honduras – the difference is that in Honduras you don’t have Presidents of the Republic who are owners of newspapers. Here that still hasn’t happened, but we have aspirations. AK: Talking of CICIG (the Commission Against Impunity in Guatemala), has it brought about any changes? IH: I believe that yes. Originally, CICIAG, which was the first proposal pushed by human rights organisations in the year 2000, and which ruffled a few feathers amongst the conservatives and ultra right in Guatemala, was rejected. It was President Oscar Berger who found the perfect excuse not to insist on the ratification of the agreement which would have created CICIG, which had a wider brief than CICIAG. During Berger’s government they began to negotiate a new commission, which was CICIG. We said CICIG is CICIAG. Sholca, sholco in Guatemala is someone who lacks teeth. CICIG had teeth, but CICIAG is CICIG without teeth, maybe with some teeth lacking because the brief it had was very limited. I think that the Commission, like the Commission on Historic Enslavement, has used every last point of its mandate to advance the investigation. We, like other civil society organisations, have also supported changes in the government authorities and in the Public Ministry because CICIG is obliged to liaise with the National Civil Police and with the Public Ministry, something which the other Commission was not obliged to do. For more than a year, CICIG wasn’t able to do anything worthwhile – in Berger’s last year – because government authorities, who were in charge of the police, did not give sufficient support to ensure that CICIG could employ qualified researchers, and most importantly whose honesty was proven. The same happened in the Public Ministry. With the change of government, one of the merits of Álvaro Colom’s government is that for some reason the pressure which we are exerting has worked on high government officials and they have managed to make changes in the Ministry of the Interior and the Public Ministry. That marks a radical change of course in the functioning of CICIG. CICIG manages to find …??? … in local institutions with which it has to liaise in order to further its process of investigation. I would say that CICIG started off as sholca, but found someone to put on a prothesis. I would say that sadly, for what it signifies, the death of Rodrigo Rosemberg gives to CICIG the support of another actor that isn’t widespread but is powerful and has the media, and that is the actor who begins to complain that he doesn’t trust the responsible authorities in CICIG. This says a lot, that is to say, CICIG is not the emblem of human rights organisations and that the press have built us up as the ones who arrest delincuents. No, CICIG is the instrument of society, we believe that to have managed to build this image and to have created this degree of confidence is a positive change. And we hope that there is an attitude of relative honesty on the part of the media who have pushed this, an attitude of understanding that if the symbol of CICIG falls there is not going to be an argument about campaigning against it. So what we want to do now is to make certain that CICIG produces a sustainable change, and that sustainable change in my opinion can only come about through the generation of local capabilities to fulfill their functions. Otherwise, we will have won some cases, but not as a society. We need to have a good enough tool to produce a structural change. AK: In the Prensa Libre there is an interview with Carlos Castresana, but before that there was an article which says that CICIG is not Guatemalan and that that is not fair. People here in Guatemala, the authorities, say that they don’t want it because it’s a foreign organisation and therefore has no credibility. IH: It’s a United Nations organisation, so it comes from outside. It’s an external actor, not a local one. It’s not a national entity and has no legitimacy and no credibility. That is part of the arguments which some time ago were used against CICIAG, against CICIG and against MINUGUA because always as far as human rights violations go in Guatemala foreign authorities have been very strong in their remarks. So whoever has supported the system of impunity rebukes this foreign image, which highlights bad Guatemalans, paints us in a bad light internationally and speaks badly of Guatemala. That’s what the military said during the armed conflict, and now some actors still say it and consider the presence of the United Nations threatens national sovereignty. It’s a concrete expression of a very strong xenophobia that is well rooted in that type of actor. It’s a selective xenophobia because it’s towards the external actor who takes a position of questioning the exclusion, the discrimination, the human rights violations. If the US Army comes here, they have to let them enter; if the FBI comes, the FBI must have an office here – there’s no intervention in our sovereignty, there’s no intrusion into our internal affairs. It’s a selective xenophobia which has class origins and an ideological position. I’m impressed – I didn’t know that there was also an article in Siglo XXI (the article that Alice mentions). It’s an indication of a very strong push by the Press Office of CICIG and at times it makes me fearful when they give so much space to CICIG in the media because it could also generate high expectations and the hope that everything can be resolved. When in fact CICIG can’t rise to that, they’ll throw all the rubbish of the world at it. AK: What are the dangers for a defender of human rights such as yourself? IH: In general terms we are in permanent confrontation with a conservative position in the sphere of the media which uses the work of human rights defenders to question all national struggle and all social struggle for the purpose of bringing about national change. We are under the world’s magnifying glass, and when I say all the world I’m referring to the media, to a conservatism so marked from the military intelligence services to the prosecution service of Guatemala. We are questioned because we work with funds from international solidarity and we have practically built something positive in our own culture by paying our dues. This is different from Guatemala’s big companies which seek out every possible way of avoiding paying their taxes. Our organisations are under the magnifying glass of all types of persecution that we must be sure to have covered all angles of all legal matters. As for prosecutions, in recent years we’ve been cited for prosecutions on three occasions, as an institution and in my case in a personal capacity. In all cases things have worked out well because all our papers are in order; but at each step the organisations feel a kind of persecution by these means, when we’re actually at a strong level. At least it’s a waste of time because you have to assure yourself and get through a full day when we are feeling very strong, and to go a full day whilst they prepare and bring over your documents. If those aren’t the problems, then the other risks are the threats. As far as we ourselves are concerned these haven’t been a problem, but we have seen human rights defenders who have lost their lives. The number of assassinations is rising in the field of human rights defenders, so the risk even includes death. In our case, in May this year we had a series of threats. Between the 2nd and 5th May, six members of our team received 20 text messages by mobile phone that included death threats and demanded the turnover of declassified information. Declassified information is information which has been held by the security forces, like reports, etc., and which has been made public. So to declassify it was to remove its secrecy. Our organisation worked in support of the Human Rights Attorney in 2003 on the declassification of files relating to the now defunct Presidential Staff, which was the military detachment which provided security to the President of the Republic. According to the Peace Agreements this body was closed down and replaced by the creation of a civil entity. When it was closed down all its documentation had to be incorporated into a public archive. It wasn’t made public, but the Army and the Attorney General’s Office were given the possibility of accessing the information. Our organisation worked for more than a year taking digital photographs and we got 800 disks with almost a million images that contained the information. One of the text messages insisted that we were going to deliver this information to the Attorney General; but he already had this information. We did all the work, and the Attorney General still had not made it public. But it was as if the military wanted us to deliver this and other information that they believed we had, but which wasn’t in our power. What information do we have? Declassified information which is already in the public domain, because we have an agreement with the National Security Archive of the United States. We have it and we make it available to the public and we give training mostly to organisations which are pursuing issues of genocide and to lawyers who are working on human rights. We’ve trained them in how to use the documentation to press for judicial procedures, in what kind of information there is, where they can find it and what steps they have to take to ensure that a judge will accept these documents as valid proof when a human rights case reaches them. We’ve been doing this as an organisation, so we understand that this kind of threat could come from them. Two years ago my house was broken into and the office car (which was at my house) was opened and left open, but nothing was stolen. This is the kind of action we have faced. Others have had burglaries in their offices where documentation has been taken, offices destroyed. Others have been temporarily kidnapped, or beaten, or in extreme cases assassinated. For example, a little while ago youths who were gang members decided to join organisations which were working to re-insert youths into society – they do theatre and cultural things. They killed, assassinated six of them from the same organisation. So, in extreme cases, death can occur. Up to now, over the ten years that we’ve been operating, we’ve received threats, harassment calls which are emotionally upsetting and have an impact. One has to concentrate on the protection and to invest in psycho-social support. We are 14 people in the team, and six received threats over the course of five days. This had an impact on their work and its quality. At times people think that it’s going to be passed on to the family, and so they think it’s better to get out of here. They begin to think about training another person, because the work we are doing here is so specialised and you simply don’t meet others in the street who are trained in this. So you have to begin to think about training as a part of the process of work. AK: Talking of impunity, why are some of the ex-militaries working with the police and government? IH: In fact until September last year, President Álvaro Colom had ex-militaries as his own bodyguard. President Alfonso Portillo had as his Chief of Staff a soldier who was being prosecuted for corruption. Retired General Otto Pérez Molina is the Secretary General of the Patriot Party and during the government of Óscar Berger he worked for a period as a National Security Commissioner and as it became convenient for him to conduct his political campaign he returned to the Congress as a deputy. He also competed as a candidate for the presidency, but lost. So he is the Secretary General of a political party which is an important part of the opposition in the Congress. In Congress, beginning with Efraín Ríos Montt (who is accused of being the principal architect of genocide and who is a deputy in Congress), and along with him in other parties there are approximately 6 or 7 ex-militaries. Another military man is Colonel Otto Noa. He is at the head of the Santo Tomás de Castilla company in the Guatemalan Caribbean port which is one of the places through which it is suspected that the major part of Guatemalan contraband enters the country in an organised way – all types of contraband, vehicles, drugs – they’re very diverse in their business. And I would say that they [ex-military men] are in various positions of the state, which are often not visible but they’re key positions and they maintain the structure of impunity. MM: I don’t want to put you in a difficult position, but what do you think of Álvaro Colom and the possibilities of changing the structure of Guatemalan society? IH: I don’t think that Álvaro Colom would propose making any change that would imply a structural transformation. I think that up till now he has been an apparently well-intentioned man, but he’s a well-intentioned man without a political party capable of helping him to push, even minimally, his good intentions. In Guatemala there is a phenomenon which shows itself at different levels, in both politicians and in social organisations. I know sister organisations with which we have serious differences on account of the way in which they relate to power – from a poorly understood political pragmatism they accept the idea of giving way on whatever things for the sake of gaining a tiny bit. We believe that negotiation is important, and one can negotiate certain things for the sake of seeking others, but it’s not necessary to negotiate questions of principle or to negotiate so many questions of principle that you end up not knowing where you are and what you stand for. I believe that that has happened to the President of the Republic. In order to reach the presidency and in the belief that having got the presidency would enable him to do everything, he allowed any kind of person to get into his party and to get to Congress and accepted whatever kind of financial support they gave for his campaign. In the end, he remained trapped inside those networks, and not in the social support networks in which he had intended to integrate himself. So, some changes can be positive, but they are not changes of a structural nature. I begin to doubt if this country’s structure can be changed in the short term in an easy way through politics. I think there’s a need for a sustained effort over the long term, for the construction of an alternative politics which right now does not exist for the vast majority of the Guatemalan population. I strongly questioned the candidacy of Doña Rigoberta Menchú in the last election because it brought out the coffee-growing oligarchy which was the major promoter of the most retrogressive and most racist laws in Guatemala, and which probably explains why, without there being a clear and strong public movement, many of the Mayan population didn’t vote for her but rather for Álvaro Colom. I believe that in a strongly self-critical approach, she got the message and is very probably trying to construct a new project. I don’t know how easy it’s going to be, because she lost/wasted the most valuable opportunity. But perhaps she will be able to regain this capability in the future, or someone within the movement might manage to build a solid base. At the moment, coming as I do from the left, I can see no possible alternative within the left nor any capacity to build this alternative. So I think that although it doesn’t represent a solid ideological position of the left, perhaps a proposal which arises from the grassroots of the Guatemalan Mayan people may manage to develop some structural change, but it’s not going to be in the short term. And that means that whatever happens, there will be a confrontation with the oligarchy which continues to be the powerful boss of this country, and which, in my opinion, is in large part tied to mafia capital. IH: I think that he is creating things which could help towards the future, certainly in these programmes which have a secondary or subsidiary effect. But there are people that don’t have anything, don’t have enough to eat from day to day. People have to forget their concerns because they have to concern themselves to provide food from day to day, and also they have to ensure that their daughters and sons get to school, because many of the benefits are conditional on their sending their children to school. That is generating a different relationship between each actor and the state, creating minimum conditions of empowerment and citizenship. That’s not going to yield results, not even for this government; but I believe that it will do so further on in time. 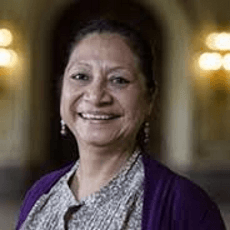 AK: And Rigoberta Menchú – are you hopeful? IH: I think that if she manages her position in a self-critical way and seeks wide alliances – not in the capital but with other actors – she could be a figure who could convince people from the grassroots. What happens is that political campaigns in Guatemala require millions; people believe that if you don’t have millions, then …. But I believe that there are still possibilities to win over social groupings which are committed to a hard and constant struggle but which offers the only possibility of change and of compromise. MM: Do you also work with Casa Alianza?